When it comes to portability, Coleman has been a household name for such grill. Coleman is synonymous to outdoor fun and designed to withstand windy weather. It is the perfect companion for sports events, camping, tailgating and even just simple family picnic. They have produced a number of grills in the market, mostly portable gas grills and few charcoal grills. However, we will only be putting a spotlight on their gas grills and have put up a whole list of it. There’s no argue that all models of Coleman gas grills showcases portability either through the size and weight of the equipment or with the help of their feature design of easy handle and roller wheels. You can break down their models into three classifications: tabletop, RoadTrip series and the NXT generations. We aim to give you the best option for each. It’s actually a lot harder to decide on which of the RoadTrip series is the best as most of their functions and features are really similar to each other. But after deliberating and comparing it to each other, we found the RoadTrip LXX to stand out. In fact, we have already included this model among our top picks for “Best Portable Gas Grills” and received a special mention on “Best Gas Grills Under 200 Dollars.” You might want to check those out as well! Now if you’re always up to outdoor grilling and likes to travel a lot, this is a great deal for you. There are key features that you can only find here. First is its interchangeable cooking surface which is one of the coolest feature of the RoadTrip series. They support various cooking surfaces, grates, griddle and stove, making this grill a lot versatile and make this lasts longer as you can easily find parts readily available. And since the cooking surfaces are interchangeable, if you purchase a griddle and grate surfaces, you can barbeque hamburgers on the grates while frying on the bacon all at the same time! The wheels and large handle design add-on for these models are really handy and makes it easier to move. Its cooking space of 285 square inch offers more than enough space for cooking a number of foods all at the same time. The LXX model is one of the best Coleman gas grills that managed to produce a great balance between cooking space and easy portability. Here comes the part where LXX outshines its other counterparts. Although all of them have high BTUs and can heat up high, LXX has a slight heat advantage over the LXE and LX models, getting closer to the ideal 77 BTUs per square inch heat to space usage ratio. It has a total of 22,000 BTUs compared to 20,000 BTUs for the LXE and LX models. This is the only model with a built-in lid thermometer as well. In terms of the price, the LXX model is at an affordable price of $199.99 just in between the price of LX and LXE. You can also purchase this even at a lower estimated price of $154.98. It also received generally positive reviews among its users, for an average of 4.2 out of 5 star rating. 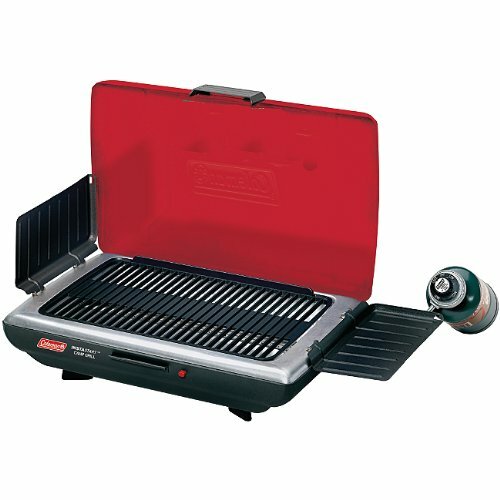 Recommended for camping, this tabletop propane grill will surely complement and not get in the way of your adventure! You don’t have to worry if you forgot to bring your matches since it has matchless igniter feature. Plus, you can easily bring this anywhere for its compact size and handy fuel holder, which can fit 16.4 ounce of disposable propane bottle, enough to last for days and serve food for your campers. But you don’t have to go camping just to enjoy this, you can also bring this pretty much everywhere, to your family outing, a visit at the park, for picnics, trip to the beach and even hunting within your mountains. What separate this from other tabletop cookers, are its advantages over weight, ability to fold flat for easy packing and transport. 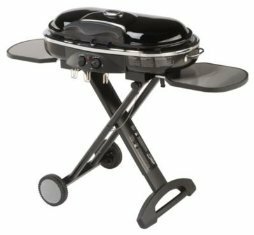 This only weighs around 14.5 pounds, which is ideal since before one can be considered as a camping grill, it has to weigh within 10 to 15 pounds parameter or at least less than 20 pounds. Aside from its guaranteed portability, functionality is also vital. Most common problems we face when we’re outside grilling are having to deal with windy weather and making the grill too hot causing the table it sits on feel hot to touch as well. Coleman had kept this in mind and produced a great design to solve this problem. Coleman PerfectFlow InstaStart has a stand up lid and two flip-up side panels to protect the cooking surface and keeping the flame from getting blown by the wind; making sure to keep the heat on the food and even cooking. And at times you won’t have to flip the side panels up, you can use it as small side tables as well, which is quite versatile on its part. Another important factor is cleanup, not just in tabletop or camping grills, but keeping your equipment clean and well-maintained can really extend its longevity. While in terms of portability, this very important because you would not want to pack a greasy and messy grill with your gear or even leave it laying around outside as you may attract scavengers. With that problem, it is resolved through its removable porcelain-coated cooking grates and a removable grease trap, which happens to be commercially introduced as “dishwasher safe.” This makes it very handy and easy to clean your grill even by just packing a dishwasher. PerfectFlow InstaStart is not just light to travel, but also light on your pocket. With just less than $100 bucks, you can bring this home and along to your adventures trips! You can even buy this at a lower deal on Amazon, priced at $77.02 as of this writing. Users have also gave this 3.9 out of 5 star ratings. Most problems encountered by this users are also a common problem that people can have with their tabletop grills. Hence, this Coleman gas grill is already offering you a great deal and value for your money with its edgy capability and features. If you find its cooking surface lacking and face with cooking complications encountered with these type of grill category, you may want to shift to other portable gas grills, and try the RoadTrip and NXT series. The NXT™ Generation is the newer manufactured versions of the RoadTrip gas grills by Coleman. 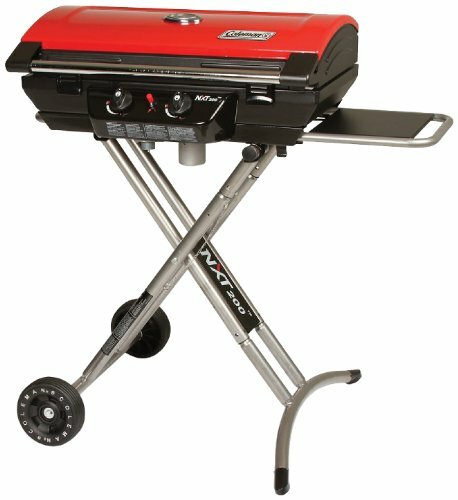 They still have similar features like their unique interchangeable components for stove, grate and griddle; and their scissor-cross design that allows you to easily pull and transport the grill. However, these generations are slightly more expensive than the RoadTrip series and it only comes with the grate so you will have to buy the other components to maximize that experience. To know more, here’s a rundown of its specifications. Generally, the NXT™ series have larger cooking surface of 321 square inches, which allows you to cook 18 hamburgers at most all at the same time, spacious enough to serve for larger crowd. However, the highest BTUs it can reach is 20,000 and just 15,000 for the NXT™ 100. Still, 20,000 BTUs is already high enough to also sear your meats for a travel gas grill. Another advantage of the NXT™ 200 is its capability to connect to 1pound or even up to 20 pound propane tank, this way you can cook longer, not worry on running out of fuel and no need to keep going back and forth to buy a propane bottle. You can quickly set this up and instructions are easy to follow. There’s also an InstaStart™ igniter for matchless lighting and lid has a temperature gauge which is really convenient to tell you how hot the grill is. But you still have to be careful as gauge may accurately read the temperature only at the lid better than the actual burner. Tender and juicy pork roast was easy and you can easily clean the Coleman gas grill which is great for keeping it running for years to come. All you need is to simply wash off the removable components of the grill and spraying out the inside. The instructions say to clean the grill with tools but a simple spray with mild soap and the garden hose worked very well as long as you’re careful. Aside from having to purchase the other parts of the grill for its mix and matching feature, you will also have to buy the LP tank hose yourself. Other than that, the NXT™ is a great deal and value for money as well. It’s in between the price range of the NXT™ 100 and 300 series. Originally priced at $286, it’s now down to $219.99, it’s only slightly more expensive than the other RoadTrip™ series. Not to mention, you can actually buy this even at a lower price in Amazon at an estimated cost of $199.99, a better deal for you. Since it’s still relatively new model, there hasn’t been much feedback about it, but it did got 4.8 out of 5 star rating. Hi,I log on to your blogs named “Best Coleman Gas Grills | Best Gas Grills” regularly.Your writing style is witty, keep up the good work! And you can look our website about daily proxy.